In this month people in most parts of Pakistan starts to feel a considerable change in the weather i.e. some chill in night and mild or pleasant in the day. But in Karachi it normally remains hot in October especially hot in the day and sometimes little bit cool night & morning. Pleasantness in Karachi during summer is mainly due to Sea Breeze that blows from West or South-West from the end of June to September. However usually in October that sea breeze stops then dry and hot breeze blows from North or North East form dry lands that mostly causes the day temperature to rise even up to 40°C. The weather remains mostly dry during this month in Karachi and its surroundings. 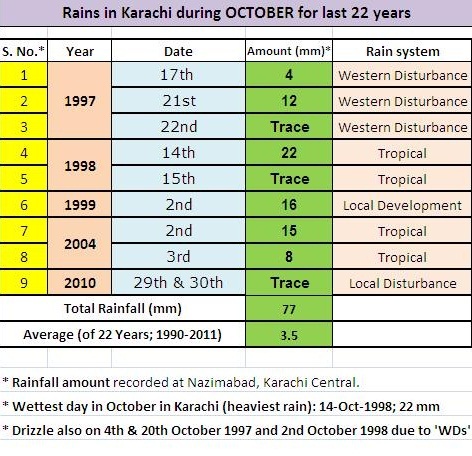 In last 20 years or so Karachi received rain very few times in the month of October that was in 1997, 1998, 1999 and 2004, also on 29th & 30th October-11, parts of the city received light rain shower. Rain in 1998 & 2004 was due to tropical storm / disturbance or low in the Arabian Sea, where in 1997 there were 3-4 rain activities occurred due to WDs including some intense lightning & thunder and in 1999 was it was a more general rain due to a local developed activity. 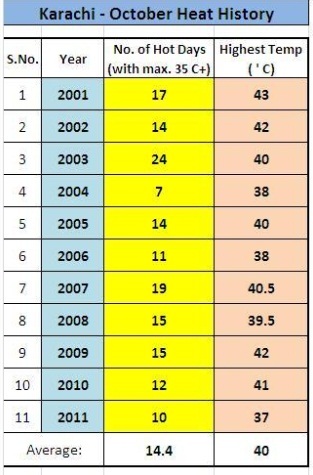 As far as heat in October, only 1997 had a bit pleasant October as maximum temperature reached not more than 36°C in that month otherwise it reached 38 to 42°C in most of years. ← Pakistan Weather Portal (PWP) – September 2012 in Review!